Reverse several weeks. The calm of reading inside while showers waltzed with wind. The lull of a warm living room. That’s where I wanted to stay, not venturing out into the grey with my parents for an hour and a half’s car journey on a quest for the UK’s tallest waterfall. But I was persuaded otherwise, told that I might regret it and that Elizabeth Gaskell could wait. The next morning we drove to Pistyll Rhaeadr. It was an unplanned interlude for me, but a preconceived idea for my dad. He wanted to swim in the dark pool frothed by falling water and I took my camera in order to snap him in that freezing moment. My mum and I watched from the rocks as he waded in, squawking up a racket until the moment of ducking beneath the surface. I’ve seen him do this many times, but there’s still something magnificent in watching the subsequent explosion of a head emerging from the water in a plume of spray. Then, this being Wales, it rained. We retreated to the car for a flask of coffee. So far, so predictable. We even had foil-wrapped sandwiches. But there was real pleasure in sitting in a dry space, watching drizzle hit the windscreen and being warmed by the coffee. Mundane moments perhaps, but memorable nonetheless. When it cleared we pulled on boots again and walked back to the waterfall - a staggering sight. The scale is overwhelming; the continuous motion, the plunge and stretch and power. It suggests something of the concept of the sublime, roughly defined as a combination of awe, grandeur and (sometimes) terror; the acknowledgment of things beautiful and vast. 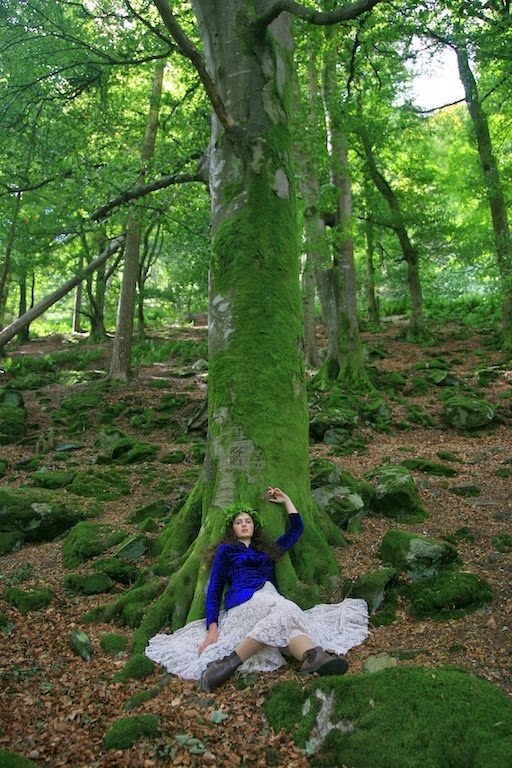 Aesthetic theory aside, it was also an extraordinarily gorgeous place that shrieked, "great backdrop for a style shoot". Yet I had no make-up on, (and none with me), my hair was barely brushed and I was swaddled in an oversized, fringed cape to ward off the cold. What I was wearing underneath had been flung on between brushing my teeth and grabbing reading material for the journey. And despite the fortuitous mix of lace skirt and velvet jacket (proving previous claims that I really do go hill-walking in the most impractical of get-ups), it needed a little something else. But what? Nothing to hand other than the landscape around us: damp stones and soft, mossed trees and thick ferns. The ferns were the solution. Mum twisted and tugged a few fronds until I had a sheaf of green to work with. I plaited together three strands to form half a crown, then did the same again, knotting the stems of the two sides together, before wrapping additional leaves around to strengthen the structure. This wet and rather muddy bit of weaving felt like a satisfying achievement when the crown was pulled down over my hair. What better accessory than something created on the spot from 'found' materials? It was one part Cicely Mary Barker, one part Fairie-ality, with a dash of the childish glee found in making daisy chain necklaces or twig tiaras. Improvisation in unlikely circumstances is exciting. I like the quality of spontaneity required, the on-the-spot creativity. Whether it’s an unscheduled outing, a foraged wild picnic or a quick invention, all are in the spirit of doing something here, now, because you can. And my, how marvellous the experience. Everything I'm wearing is charity shopped second hand, from the velvet jacket to the Jones' Bootmakers battered boots. Beautiful photos. I love the velvet jacket. I loved this post - both the photos and writing are so evocative! 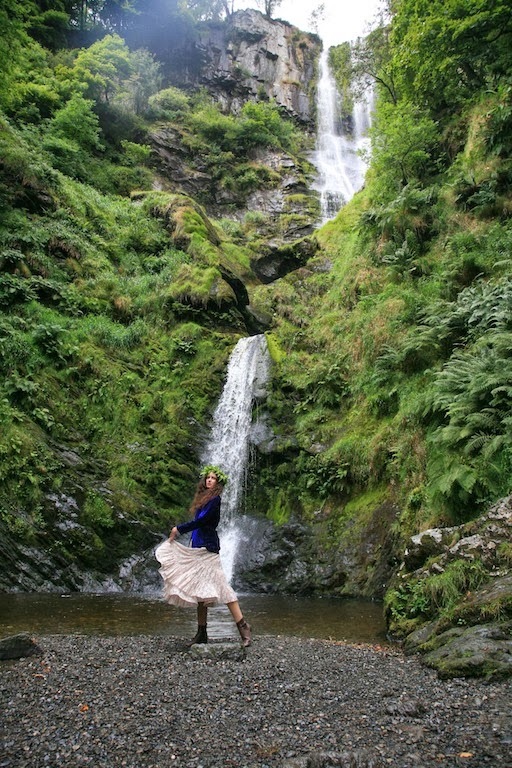 La lace of your skirt blends with the waterfall. Such perfection, dearest Rosalind. What marvellous images and a great read. I've not been to Wales in ages, it's incredibly beautiful! Your styling and elegance always amazes me. Keep enjoying your experience. You are living proof that you won't melt away or spontaneously combust if you explore the outdoors in anything other than goretex and sweat pants. This is brilliant. Your improvised headpiece and lack of makeup are the finishing touches. That photo of you under the tree is a particular favourite. 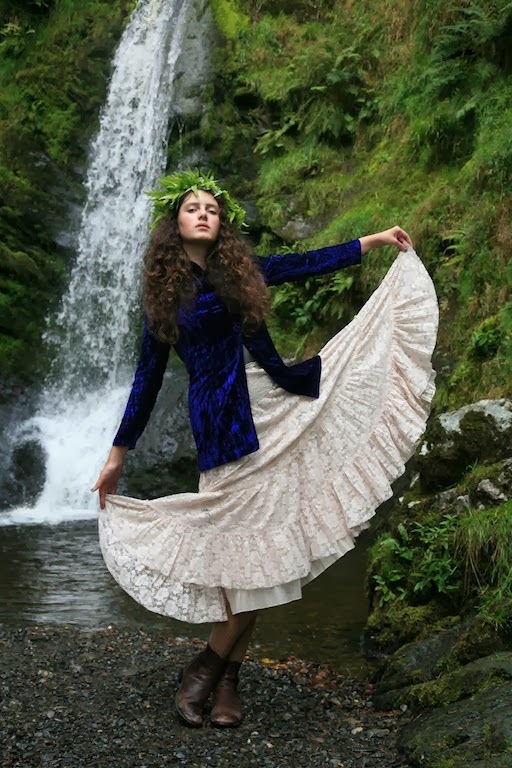 The outfit is gorgeous (that twirly lace dress is a beaut), the pics are amazing (particularly the one of you sat facing left with the waterfall in the background) and you have a fern crown. Wowzers! You look lovely without makeup, and it was perfect for the nature-drenched feeling of this shoot. What a beautiful place, too! Only you could make this moment so magical on "film". You look as though the best makeup artist carefully shaded your eyes and rouged your cheeks, fussing with your hair to give it the requisite undone look. The stylist pulled out a full wardrobe, trying this and that, until the perfect textures, colors, and silhouettes were decided upon. The headdress is indeed the crowning touch. The photographer is brilliant, by the way. You really are the most glamorous walker in the land! That improvised crown was an ingenious idea, adding a wonderful faerie charm to an already delightful ensemble. So proud of you for braving wet Wales in a delicate white lace skirt. That's amazing! I love that you just made the crown like that. It's also incredibly sweet that your family helped out and put up with the whole thing. I have to say when I wear anything less than practical for a walk in the woods with my family they all berate me with the 'are you sure you don't want a raincoat? ', 'would you like some extra socks?'. lol. I enjoy being pretty in the woods. Are you telling me that this shoot was TOTALLY unplanned? Then what we have here is a creature of a whimsical existence... seriously, you look taken out of A Midsummer Night's Dream play or something. Besides writing beautifully, you are a really good model and have a special beauty to you! Not to mention your peculiar yet magical style. This is your first entry I ran into, but I have checked out your blog for literally a whole entire hour... so mind-blown. 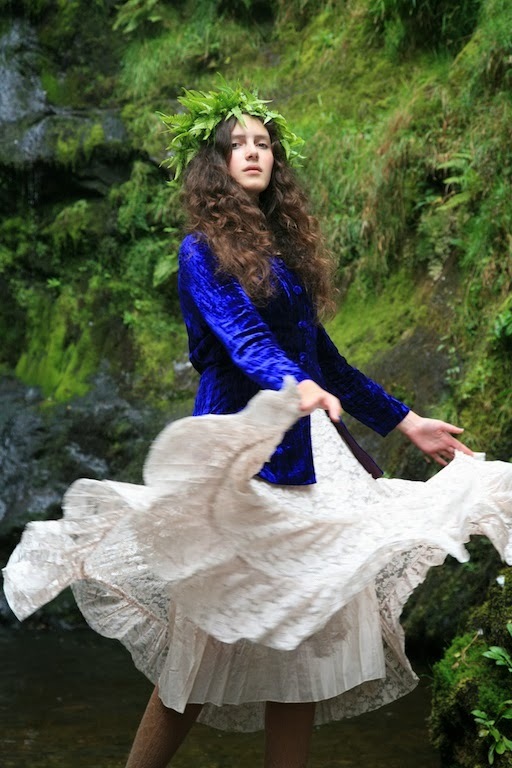 Faerie-ality! Gorgeous. The lack of make up actually brings out your nature/water nymph quality. 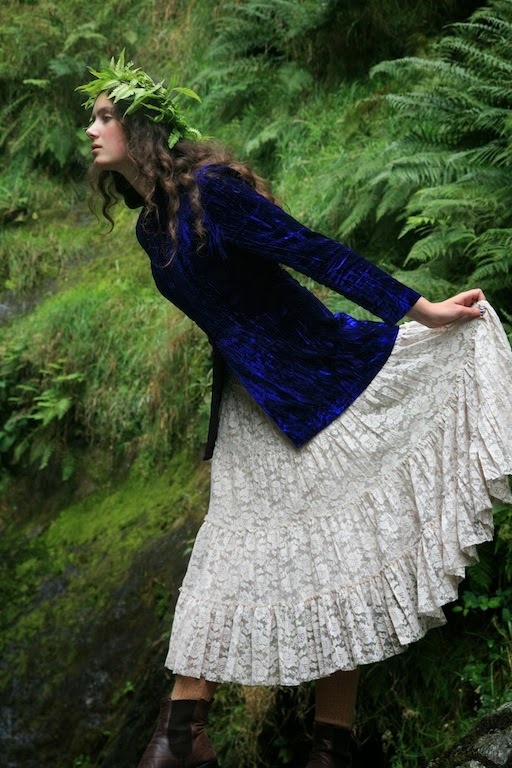 Hard to believe you weren't planning a photo shoot here with the lace skirt and velvet jacket :) Spontaneously accessorizing with ferns was absolutely brilliant. Those are magnificent waterfalls! It reminds me of the falls we went to back during my summer holidays, all tiered from great heights, even pooling at different levels too. Alas, my athletic swim shirt and aquatic shoes were hardly worthy of a similar shoot, but the falls by themselves were! Such inspiration to begin a day's journey into the countryside. Thank you, Rosalind.